Join us to plant a Forest for the Future – a tree for every child in Golden Bay. The Forest for the Future planting day is being organised by Golden Bay High School students, Forest and Bird, and Project Janszoon. 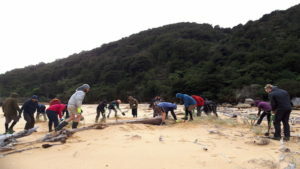 The groups aim to plant 695 trees at Hadfield Clearing, in the Abel Tasman National Park. Kahikatea, or white pine, are the giants of the forest and were once found in most of the swampy areas of Nelson and Tasman, but these ecosystems are now very rare. The kahikatea forest remnant on the Hadfield site is one of the largest stands of this forest type left in the region. Project Janszoon is enhancing the remaining forest and will restore 25 ha of swamp forest on the Hadfield Clearing river flats. 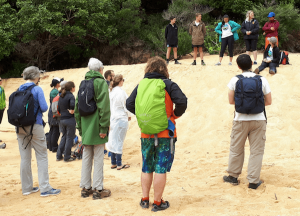 The site has been adopted by Golden Bay High School and students are keen to see as many members of the community as possible involved in this planting day. Since 2014 over 40,000 flax and trees like manuka have been planted on the site to provide shelter for larger trees. Project Janszoon restoration supervisor Helen Lindsay says now it is time to start putting in some of the larger canopy trees like kahikatea.